A text control allows text to be displayed and edited. It may be single line or multi-line. Notice that a lot of methods of the text controls are found in the base wx.TextEntry class which is a common base class for wx.TextCtrl and other controls using a single line text entry field (e.g. wx.ComboBox). wx.TE_PROCESS_ENTER: The control will generate the event wxEVT_TEXT_ENTER (otherwise pressing Enter key is either processed internally by the control or used for navigation between dialog controls). wx.TE_PROCESS_TAB: The control will receive wxEVT_CHAR events for TAB pressed - normally, TAB is used for passing to the next control in a dialog instead. For the control created with this style, you can still use Ctrl-Enter to pass to the next control from the keyboard. wx.TE_MULTILINE: The text control allows multiple lines. If this style is not specified, line break characters should not be used in the controls value. wx.TE_PASSWORD: The text will be echoed as asterisks. wx.TE_READONLY: The text will not be user-editable. wx.TE_RICH: Use rich text control under Win32, this allows having more than 64KB of text in the control even under Win9x. This style is ignored under other platforms. wx.TE_AUTO_URL: Highlight the URLs and generate the TextUrlEvents when mouse events occur over them. This style is only supported for wx.TE_RICH Win32 and multi-line wxGTK2 text controls. wx.TE_NOHIDESEL: By default, the Windows text control doesn’t show the selection when it doesn’t have focus - use this style to force it to always show it. It doesn’t do anything under other platforms. wx.HSCROLL: A horizontal scrollbar will be created and used, so that text won’t be wrapped. No effect under GTK1. wx.TE_NO_VSCROLL: For multiline controls only: vertical scrollbar will never be created. This limits the amount of text which can be entered into the control to what can be displayed in it under MSW but not under GTK2. Currently not implemented for the other platforms. wx.TE_LEFT: The text in the control will be left-justified (default). wx.TE_CENTRE: The text in the control will be centered (currently wxMSW and wxGTK2 only). wx.TE_RIGHT: The text in the control will be right-justified (currently wxMSW and wxGTK2 only). wx.TE_DONTWRAP: Same as wx.HSCROLL style: don’t wrap at all, show horizontal scrollbar instead. wx.TE_CHARWRAP: Wrap the lines too long to be shown entirely at any position (wxUniv and wxGTK2 only). wx.TE_WORDWRAP: Wrap the lines too long to be shown entirely at word boundaries (wxUniv and wxGTK2 only). wx.TE_BESTWRAP: Wrap the lines at word boundaries or at any other character if there are words longer than the window width (this is the default). TE_CAPITALIZE: On PocketPC and Smartphone, causes the first letter to be capitalized. Note that alignment styles (wx``wx.TE_LEFT``, wx.TE_CENTRE and wx.TE_RIGHT) can be changed dynamically after control creation on wxMSW and wxGTK. wx.TE_READONLY, wx.TE_PASSWORD and wrapping styles can be dynamically changed under wxGTK but not wxMSW. The other styles can be only set during control creation. The multiline text controls always store the text as a sequence of lines separated by '\n' characters, i.e. in the Unix text format even on non-Unix platforms. This allows the user code to ignore the differences between the platforms but at a price: the indices in the control such as those returned by GetInsertionPoint or GetSelection can not be used as indices into the string returned by GetValue as they’re going to be slightly off for platforms using "\\r\\n" as separator (as Windows does). Instead, if you need to obtain a substring between the 2 indices obtained from the control with the help of the functions mentioned above, you should use GetRange And the indices themselves can only be passed to other methods, for example SetInsertionPoint or SetSelection To summarize: never use the indices returned by (multiline) wx.TextCtrl as indices into the string it contains, but only as arguments to be passed back to the other wx.TextCtrl methods. This problem doesn’t arise for single-line platforms however where the indices in the control do correspond to the positions in the value string. # C++-style stream support is not implemented for Python. See StreamToTextRedirector for more details. The following commands are processed by default event handlers in wx.TextCtrl: ID_CUT , ID_COPY , ID_PASTE , ID_UNDO , ID_REDO . The associated UI update events are also processed automatically, when the control has the focus. Handlers bound for the following event types will receive one of the wx.CommandEvent parameters. EVT_TEXT: Respond to a wxEVT_TEXT event, generated when the text changes. Notice that this event will be sent when the text controls contents changes wx.TextCtrl.SetValue is called); see wx.TextCtrl.ChangeValue for a function which does not send this event. This event is however not sent during the control creation. EVT_TEXT_ENTER: Respond to a wxEVT_TEXT_ENTER event, generated when enter is pressed in a text control which must have wx.TE_PROCESS_ENTER style for this event to be generated. EVT_TEXT_URL: A mouse event occurred over an URL in the text control (wxMSW and wxGTK2 only currently). EVT_TEXT_MAXLEN: This event is generated when the user tries to enter more text into the control than the limit set by wx.TextCtrl.SetMaxLength , see its description. Create Creates the text control for two-step construction. DiscardEdits Resets the internal modified flag as if the current changes had been saved. EmulateKeyPress This function inserts into the control the character which would have been inserted if the given key event had occurred in the text control. GetDefaultStyle Returns the style currently used for the new text. GetLineLength Gets the length of the specified line, not including any trailing newline character(s). GetLineText Returns the contents of a given line in the text control, not including any trailing newline character(s). GetNumberOfLines Returns the number of lines in the text control buffer. GetStyle Returns the style at this position in the text control. HideNativeCaret Turn off the widget’s native caret on Windows. HitTestPos Finds the position of the character at the specified point. HitTest Finds the row and column of the character at the specified point. IsModified Returns True if the text has been modified by user. IsMultiLine Returns True if this is a multi line edit control and False otherwise. IsSingleLine Returns True if this is a single line edit control and False otherwise. LoadFile Loads and displays the named file, if it exists. MarkDirty Mark text as modified (dirty). PositionToCoords Converts given text position to client coordinates in pixels. PositionToXY Converts given position to a zero-based column, line number pair. SaveFile Saves the contents of the control in a text file. SetDefaultStyle Changes the default style to use for the new text which is going to be added to the control using WriteText or AppendText . SetModified Marks the control as being modified by the user or not. SetStyle Changes the style of the given range. ShowNativeCaret Turn on the widget’s native caret on Windows. ShowPosition Makes the line containing the given position visible. XYToPosition Converts the given zero based column and line number to a position. flush NOP, for file-like compatibility. write Append text to the textctrl, for file-like compatibility. Constructor, creating and showing a text control. parent (wx.Window) – Parent window. Should not be None. id (wx.WindowID) – Control identifier. A value of -1 denotes a default value. value (string) – Default text value. pos (wx.Point) – Text control position. size (wx.Size) – Text control size. style (long) – Window style. See wx.TextCtrl. The horizontal scrollbar (wx``wx.HSCROLL`` style flag) will only be created for multi-line text controls. Without a horizontal scrollbar, text lines that don’t fit in the control’s size will be wrapped (but no newline character is inserted). Single line controls don’t have a horizontal scrollbar, the text is automatically scrolled so that the insertion point is always visible. Creates the text control for two-step construction. This method should be called if the default constructor was used for the control creation. Its parameters have the same meaning as for the non-default constructor. Resets the internal modified flag as if the current changes had been saved. This function inserts into the control the character which would have been inserted if the given key event had occurred in the text control. 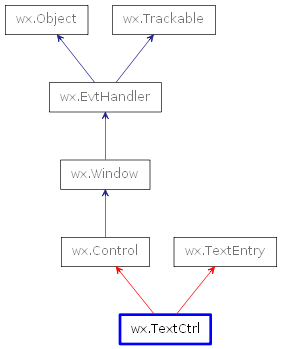 The event object should be the same as the one passed to EVT_KEY_DOWN handler previously by wxWidgets. Please note that this function doesn’t currently work correctly for all keys under any platform but MSW. True if the event resulted in a change to the control, False otherwise. Returns the style currently used for the new text. Gets the length of the specified line, not including any trailing newline character(s). lineNo (long) – Line number (starting from zero). The length of the line, or -1 if lineNo was invalid. Returns the contents of a given line in the text control, not including any trailing newline character(s). lineNo (long) – The line number, starting from zero. The contents of the line. Returns the number of lines in the text control buffer. The returned number is the number of logical lines, i.e. just the count of the number of newline characters in the control + 1, for wxGTK and OSX/Cocoa ports while it is the number of physical lines, i.e. the count of lines actually shown in the control, in wxMSW and OSX/Carbon. Because of this discrepancy, it is not recommended to use this function. Note that even empty text controls have one line (where the insertion point is), so GetNumberOfLines never returns 0. Returns the style at this position in the text control. Not all platforms support this function. True on success, False if an error occurred (this may also mean that the styles are not supported under this platform). Turn off the widget’s native caret on Windows. Ignored on other platforms. Finds the position of the character at the specified point. If the return code is not TE_HT_UNKNOWN the row and column of the character closest to this position are returned, otherwise the output parameters are not modified. Please note that this function is currently only implemented in Univ, wxMSW and wxGTK ports and always returns TE_HT_UNKNOWN in the other ports. Finds the row and column of the character at the specified point. Returns True if the text has been modified by user. Note that calling SetValue doesn’t make the control modified. Returns True if this is a multi line edit control and False otherwise. Returns True if this is a single line edit control and False otherwise. Loads and displays the named file, if it exists. filename (string) – The filename of the file to load. fileType (int) – The type of file to load. This is currently ignored in wx.TextCtrl. Turn on the native spell checking for the text widget on OSX. Ignored on other platforms. Mark text as modified (dirty). Converts given text position to client coordinates in pixels. This function allows finding where is the character at the given position displayed in the text control. pos (long) – Text position in 0 to GetLastPosition range (inclusive). On success returns a wx.Point which contains client coordinates for the given position in pixels, otherwise returns wx.DefaultPosition . Only available for MSW, GTK . Additionally, wxGTK only implements this method for multiline controls and wx.DefaultPosition is always returned for the single line ones. Converts given position to a zero-based column, line number pair. Saves the contents of the control in a text file. filename (string) – The name of the file in which to save the text. fileType (int) – The type of file to save. This is currently ignored in wx.TextCtrl. Changes the default style to use for the new text which is going to be added to the control using WriteText or AppendText . If either of the font, foreground, or background colour is not set in style, the values of the previous default style are used for them. If the previous default style didn’t set them neither, the global font or colours of the text control itself are used as fall back. However if the style parameter is the default wx.TextAttr, then the default style is just reset (instead of being combined with the new style which wouldn’t change it at all). style (wx.TextAttr) – The style for the new text. Marks the control as being modified by the user or not. Changes the style of the given range. If any attribute within style is not set, the corresponding attribute from GetDefaultStyle is used. start (long) – The start of the range to change. end (long) – The end of the range to change. style (wx.TextAttr) – The new style for the range. Turn on the widget’s native caret on Windows. Ignored on other platforms. Makes the line containing the given position visible. pos (long) – The position that should be visible. Converts the given zero based column and line number to a position. x (long) – The column number. y (long) – The line number. The position value, or -1 if x or y was invalid. Append text to the textctrl, for file-like compatibility.